It won’t come as a shock that schools are required to make sure their playgrounds comply with safety standards. What might come a more of a surprise is that these standards do change, from time to time, and it’s important to keep your school playground updated and fully compliant. Australia has standards that cover equipment, indoor and outdoor playgrounds and all must be met. 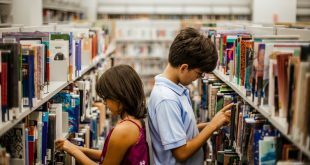 Each state has outlined relevant guidelines and listed the Australian Standards that should be adhered to, so School News recommends heading to your state department of education website to locate those documents. Australian Standards can be purchased or viewed with a subscription via SAI Global Limited, which can be accessed online. In many ways, this is the fun part: choosing and designing an fun-filled, engaging playground that is conducive to impactful learning and positive stress relief for students is an exciting prospect. Many schoolchildren would envy the task: designing a playground? Surely that’s the dream job. Of course, designing a playground is more complex than a child might imagine. A property manager or specialist supplier/manufacturer will be eager to discuss available options with you, and aid in the process but the main focus must be adhering to Australian Standards. Australian Standard AS/NZS 4486.1:1997-Playgrounds and Playground Equipment. Part 1: Development, Installation, Inspection, Maintenance and Operation is particularly vital as it pertains to the initial stages of design, manufacturing and installation. Schools should make sure that any third-party involvement can prove compliance. According to the Victorian government’s Guidelines for School Playgrounds, the AS/NZS 4486.1:1997 standard is “designed to minimise the risk of injury to children using playgrounds by providing guidelines for siting and developing playgrounds, product information requirements, instructions and operating procedures intended to support sound playground design, the selection of appropriate equipment and to minimise operational hazards”. The two concepts might not ordinarily be associated with one another, but playgrounds bridge the gap. In this realm, generally, the safer the playground the more stylish it looks. 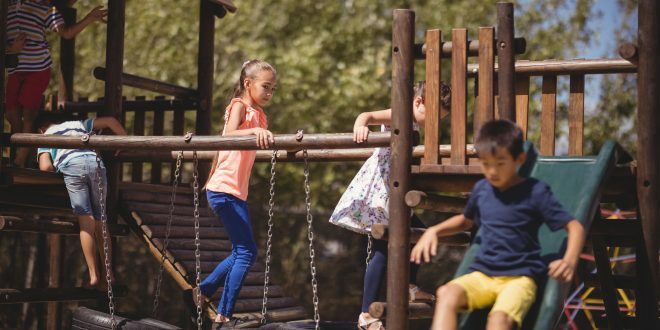 If you imagine an ‘unsafe’ playground, it’ll be one that’s not properly maintained or cleaned, is broken and filthy, with something like a hard concrete floor or trip hazard weeds. Not so pretty and certainly not safe. You could also place more dangerous playground equipment in this category – dirt tracks for bikes, or skate ramps. There’s a huge variety of playground options available now, from mobile structures to trampolines and nature play, so it’s more important than ever to check that all requirements are met. When designing a school playground, it’s important to consider how difficult a piece of equipment or design will be to maintain, how long it is likely to meet the relevant Australian Standards and whether it hinders the playground’s ability to provide a safe student environment. Fully compliant playgrounds have to be properly maintained, neat and tidy. Surfacing is vital and there are a variety of options to consider, with different pros and cons, from wood-chip or bark mulch to artificial grass, sand and soft fall. The latter is a type of brightly coloured rubber, usually recycled, that can be installed in different patterns or designs but may pose risk when very wet or in high temperatures. Wood-chip or bark mulch has its own pleasingly natural aesthetic and is easy to install but is easily moved during play and can hide trip hazards like stones or toys. It is also possible to employ a combination of surfaces in the construction of a playground. Depending on the design, this could be an ideal solution. However, care must be taken that the surfaces don’t interact in a way that poses more danger. Every surface-type requires a rigorous maintenance schedule to help prevent injury and they should all be tested for compliance. In-depth inspections should be taken out at least once a year; particularly if you have organic surfacing that will require topping up. Look out for signs of wear-and-tear in synthetic surfaces as well as play equipment and any shade installations. Of course, if a child sustains an injury on the playground this should be investigated immediately, regardless of how minor the injury. Previous Adam Voigt: Changing context is a start to changing student behaviour.